A serious industrial network requires special attention. Such network usually connects not only office computers, but various devices widely spread all over the facility. Monitoring, capturing and logging the data flowing in such TCP/IP network is a tough duty. 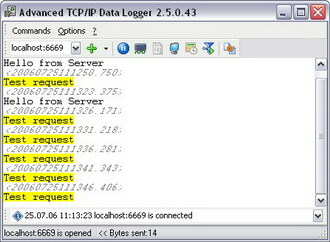 That's why we are glad to introduce our TCP Logger - full featured software for capturing and logging all data sent via TCP/IP or UDP protocol. For good reason we are proud to name Advanced TCP/IP Data Logger one of the best products for real time TCP data monitoring, processing and storing. See for yourself. Once set up, it monitors any TCP/IP or UDP ports and captures, records and exports information sent through them absolutely without your intervention, that is 100% automatically. Whether you want to merely store a log file, or to filter out some data from the entire stream, or perform a real-time data processing through DDE - all of this is possible with this neat TCP port logger, and all of these requires from little to no manual operations. Advanced TCP/IP Data Logger is much more than a simple TCP port monitor. It is a full-featured professional utility intended for industrial usage and specially designed to fulfill even the strictest requirements. Do you want to gather data from a terminal server with dozens of RS232 or RS485 devices connected to it? No problem, TCP Logger easily deals with this. Do you want to control a branchy network of industrial sensors, probes and transducers? No problem either. May be you want to interrogate devices over Internet? You know who to ask. Our TCP Data Logger supplies several cut down versions. Some versions omit some of the advanced features found in the Enterprise edition and is ideal for users who either want a low cost or free solution or are not interested in more advanced features. Read more here.